America in the 1950s was a place of Eisenhower, the Korean Conflict, McCarthy, and Sputnik. Women found themselves trapped into a mold of Donna Reed and June Cleaver, marginalized by the hyper-masculinity of the age. Mystery fiction had become a male bastion as well, promoting hardboiled private eye novels and spy fiction. It would be another three decades before groups to promote equality between the sexes in mystery fiction appeared. Yet during that post-World War II era, seven women carved out a place in the genre. These women became the bestsellers of their time by innovation and experimentation. Margaret Millar, Patricia Highsmith, Leslie Ford, Charlotte Armstrong, Dorothy B. Hughes, Mignon Eberhart, and Phoebe Atwood Taylor are in no way similar to each other in style, theme, or subject matter. 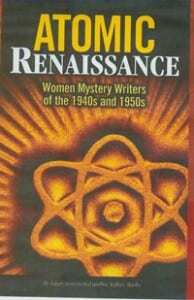 However, their writings created an Atomic Renaissance that continues to impact the mystery field today. Author of a series of biographies of mystery authors from the 1940s/1950s. Currently working on a biography of Erle Stanley Gardner, who wrote the Perry Mason series. When I first got the idea to dig up nine years’ worth of my own blog posts, journal entries, handwritten notes, and miscellaneous Internet postings, I surmised that it would be relatively easy to compile the best ones into a decent-looking e-book. As you can imagine, the only part that was “relatively easy” was the procrastination. After obsessively poring over and sorting nearly 900 pieces of writing, I came to the disappointing conclusion that very few, if any, of these pieces were good enough to pass through my filter for inclusion in the book. I was hoping to be able to glue them into a cohesive narrative detailing some of the most defining periods of growth in my life, but there just wasn’t enough substance behind many of those posts/entries/notes, especially the earlier ones, to allow me to write the story in the way I wanted to write it. I needed a new approach (or a new past). 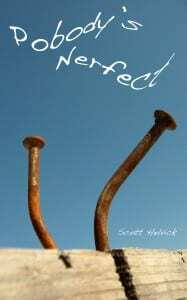 That’s when the title hit me – Pobody’s Nerfect seemed, ironically, perfect. An account not only of my perpetually problematic perfectionistic proclivities, but also, self-referentially, of my struggles with those very same proclivities in writing this book. Pobody’s Nerfect is a story of truth, above all else. It is also a story of my struggles with, among other things, love, spirituality, and intense personal growth throughout young adulthood. I certainly hope you will find it entertaining and inspiring, but I can promise only truth. I never had any plans of becoming an author; it happened by accident. During my tumultuous teenage years, I discovered the therapeutic qualities of putting pen to paper (or, more commonly, hands to keyboard). Nine years later, in a stroke of genius/insanity, I came up with the idea to throw all of those writings into a cauldron and perform some incantations to see what would happen. The result was my first book, Pobody’s Nerfect! Nowadays, I am living joyfully in Seattle in a big egalitarian house of eight people. When I’m not composing words of wisdom for the masses, I can probably be found working on my social enterprise/tech startup, participating in a contra or swing dance, or doing the dishes. Never content to rest on my laurels, I am constantly reevaluating my reasons for existing on this strange planet and fine-tuning my ambitions to line up with those reasons. My fledgling startup, called Synthebliss, will be a major part of that – even if I’m not always sure exactly how. 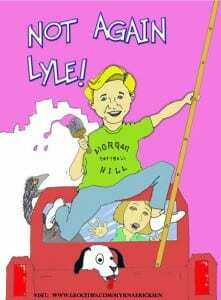 Lyle, a small town California man from Morgan Hill, likes to do things the easy way. Yet, his impulsive style often leads to chaos when his enterprises collapse around him. His wife, Jody, his childhood sweetheart, is always there to pick up the pieces, and maintain a semblance of balance with her poignant remarks. Chapters such as Pets, Marriage, Sportsman, and Lyle’s business ventures, give a hilarious insight into what makes him tick. Lyle’s foremost admirable traits are also his downfall. A good-hearted guy with the best intentions, Lyle is driven to finish what he starts in the speediest manner possible. Author Myrna Ericksen has 6 children and 18 grandchildren. She lives in California where she is involved in volunteer work and writing. She has written 7 books and is now writing her 8th. She enjoys being with familly, friends, playing her guitar and gardening. She travels around the country with her husband, visiting her children and grandchildren, always with an eye to her next book. She is currently writing a mystery/suspense which takes place in Spain. It is based on a real life happening when she was on a business trip with her husband in Spain. Myrna says she tries to keep a certain time in the day for her prayer life which gives her a Happy heart and strengthens her for whatever the day brings. It is also the time she uses to pray for all those who have requested prayer from family to friends and the internet. 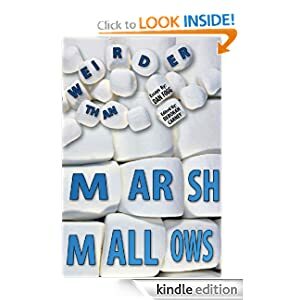 Weirder Than Marshmallows (Daniel Fogg, Deborah Carney) Book of essays to challenge your common sense. A romantic, historical, adventure into three countries, the U.S., Ecuador and Panama. Onward Peregrinos reveals why Americans went to the Panama Canal Zone, why they stayed there for a century, and what they did after leaving, through the adventures of two strong women and the men they loved. Niza grows up at her father’s side, hunting in the jungles of Panama and becomes a fearless woman. In her travels around the world with her husband, she adopts a village in Mexico, deals with wild animals in Africa, finds a little known Indian tribe, and leads an adventurous life. In between their adventures, Niza and her husband, Bob, build a horse ranch together in California where they raise a family. Myrna Ericksen was born in the Panama Canal Zone. She left upon graduating from High School to attend nursing school in San Jose, CA. After marrying she graduated from West Valley College in San Jose. She began her writing career after her children entered college. She has since written 7 books and is currently writing her 8th. Her favorite genre is Historical Fiction but she has written in many other categories. She attributes her love of writing from her travels. She and her husband have crossed the U.S. twelve times, and traveled through all of the Central American countries, Italy and Spain. It has made her books come alive to her readers. This book is free on these days only – 01/29/2013 at midnight PST until 11:59 pm on 01/30/2013. If the dates are the same that means the book is free one day only. This is an account of the four months I spent working in the former Yugoslavia, a journey I made in both in distance and time. I found myself living a lifestyle that had existed in the west forty years earlier. I was living in a friendly crime free society where people were amazed to discover that I found it necessary to even consider locking my door. But despite this, getting paid always posed a problem, and led to some strange confrontations with my boss, who at all other times when money was not the issue was always my friend. So here then are my memories of the local culture, my friends, my work, and my attempts to explore the local and neighboring areas. Number #1 Best Seller. The California Prison System houses a mixture of Mexican cartel members, Mexican mafia, Bloods, Crips, and thousands of other street gangs fighting for control and the author turns this story into a pulp thriller of true crime. Glenn Langohr takes you on a journey back into prison as he remembers a prison war with the Mexican Mafia before his release date. Days later, he got released. His friend he was in the deadly riot with didn’t. He went to Pelican Bay’s Super Max. The story follows Glenn Langohr years later as he visits his friend in Pelican Bay during a prisoner developed hunger strike against sadistic and cruel guards who get off on their isolation and enjoy adding violence to their torture. Half the proceeds are donated to the Make a Wish Foundation. Glenn Langohr resides in southern California where he spends his time doing what he loves best, reading and writing. He started writing from prison on drug charges and hasn’t stopped since. He is an usher at his church and loves to reach out to other prisoners to help them turn their lives around. Glenn is married to his dream girl, Sanette, who plays Annette in one of his novels. In an outer world that is impossible, an inner world grows out of the wreckage. Built by a little girl too young to know how it might be done, she did it her way and then lived with it all. This is her story. Searing, shocking, yet holding treasures deep where it matters. Granddaughter to the man who invented The Lemonade Diet, the Master Cleanse, she knew a different man from what the world pegged as a new-age healer. Behind Stanley Burroughs’ public face was another one. That was the face she saw. That was the man she knew. Knew too well. This is an autobiography set in the present, during the time of its own writing, but rich with the experiences of a shattered childhood. It shows the consequences of abuse, corruption, and evil on a small child and the woman she grew into – a woman saved by her unique means of engaging with her own psychology. And equally saved by her unique appreciation of beauty. Beauty that can be found even in an ugly world.